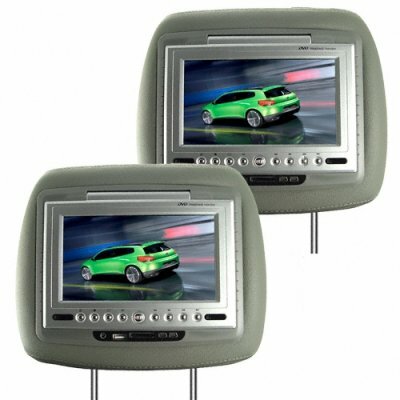 Successfully Added 7 Inch LCD Car Headrest DVD Player + FM Transmitter -Pair -Grey to your Shopping Cart. Car Headrest DVD player system with a high quality faux leather exterior in grey, and a super large 7 inch TFT LCD display for letting passengers in the grey seats really enjoy movies as you drive. on 2010-07-20 14:52:27 Great gadget! A very nice and handy thing for the money I paid for it! Easy to install - no problems at all with VW Passat B5 with leather seats and built-in air bags! Highly recommended! Chinavasion ROCKS! This product was easy to install and works great. If your chasing headphones for this product I recomend the wireless earphones with USB and mic. Manufac code U926G3W75SCV. I purchased these headphones a week after i Installed the Headrest DVDs and they work. They can be found under computer accessories and are as cheep as chips. The FM transmitter works great but that still wont stop the kids arguing. I wouldnt get one without the other. on 2010-02-12 20:03:05 It's a great product for a very good price. I tested everything and it works very well, I can't believe that it doesn't cost more. Chinavasion is awesome and I will certainly buy more products in the future. Keep up the good work. We were eager to try out. They look quite cool and the DIVX looked sharp and worked Ok as did jpeg photos, which were the only things that we have tired out so far. Company help and contacted us when we needed any extra information.